A recent article by Mario A. Murillo on Toward Freedom celebrates the historic rallies of the Minga Popular and their meetings with government officials in Bogota last week. It's been a busy series of days in Bogotá as the MINGA Popular continues to expand and flourish. From the streets in the center of the city, to the Plaza del Ché at the National University where an international forum was held on Saturday, from the media centers of the indigenous movement to the dozens of meetings taking place around the city where "Mingueros" are discussing the five point agenda with all the sectors that are interested to listen, the enthusiasm and energy of the popular movement can be felt. Toward the end of the article, Murillo discusses the role of the media and their coverage of the movement, and how the "people's narrative" is being broadcast, despite the obstacles. The massive presence of independent media at all these events - video cameras documenting the marches and rallies, photographers clicking away at the dramatic militance of the protesters, community radio producers gathering natural sound, speeches, and interviews for their respective outlets - are presenting a comprehensive alternative narrative - the people's narrative - that undoubtedly is having an impact on how the Minga is playing out with public opinion. It has resulted in tremendous solidarity from abroad, and unprecedented collaboration and participation from ordinary people here in Colombia since the Minga began. 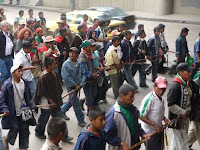 Despite the false accusations of the government, despite the racist underpinnings of the media coverage, and the almost deliberate mis-information that has accompanied it, the people have come out in small towns and large cities to welcome the mingueros, and join with them in solidarity.